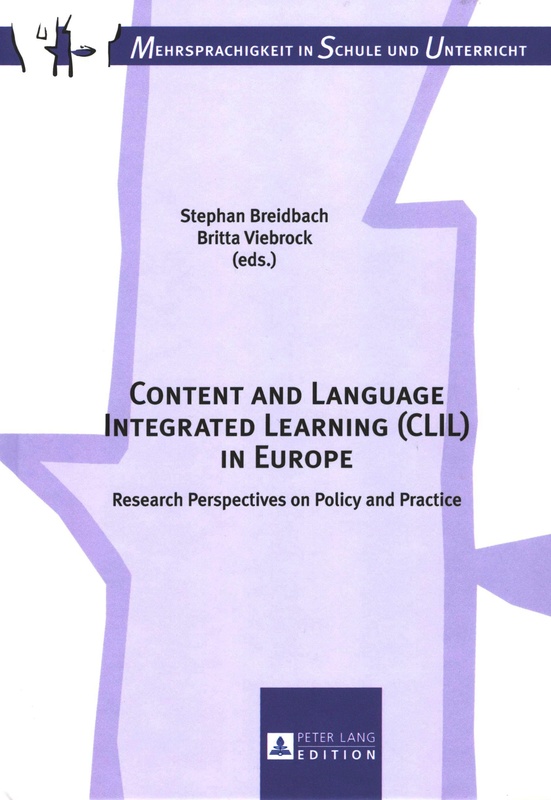 Content and Language Integrated Learning in Europe (CLIL) – Research Perspectives on Policy and Practice, edited by Stephan Breidbach & Britta Viebrock (2013, Peter Lang Publishers). CLIL has received a strong tailwind in European educational and language policies. However, an overly speedy implementation of CLIL ‘for all’ carries many uncharted risks for all groups of stakeholders. The purpose of this book is to link the growing empirical knowledge about the full complexity of CLIL to the current European educational and language policies. This bi-lingual volume (English/German) brings together authors from several European countries to present significant findings from recent CLIL research in the light of the developments in education policy. The four parts of the book focus on the reconstruction of learning processes, learner achievement, investigations of the concept of CLIL, and critical reflections on the current “CLIL boom”. Stephan Breidbach, Daniela Elsner, Özlem Etus, Marie-Anne Hansen-Pauly, Katja Lochtman and Britta Viebrock. A preview of the table of content will follow here, soon. Please consider recommending the volume for purchase to your librarian. Direct orders can be placed with Peter Lang Publishers.